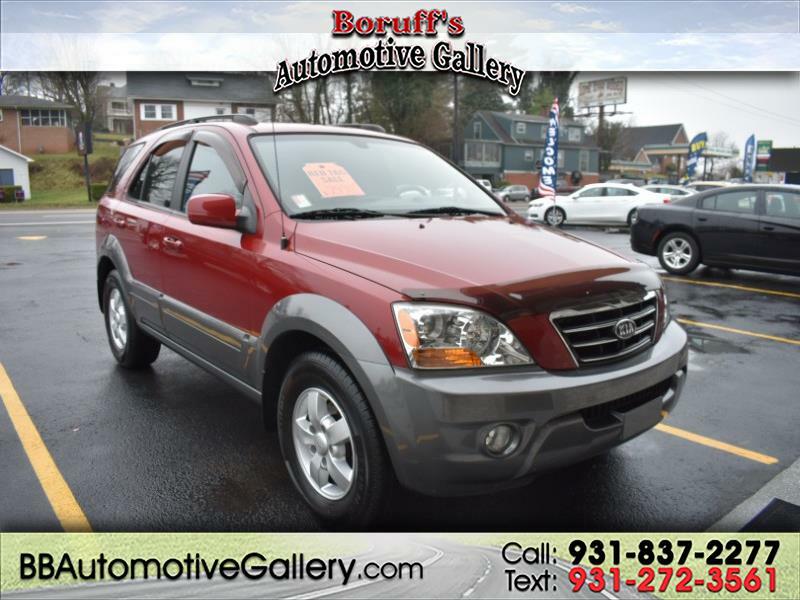 Check out this 2008 Kia Sorento EX now available at Boruff's Automotive Gallery in Sparta, Tennessee.This Sorento was a local trade-in and comes with all the features one would need for any road trip or daily commute! With a strong and reliable 3.8L engine and a smooth shifting automatic transmission, plus additional features like keyless entry, steering wheel mounted controls, power windows and locks, cruise control, luggage rack, and plenty of storage space; this Sorento is ready for the open road! Stop by today and experience the Bill Boruff difference! Additional pictures and a free Carfax Vehicle History Report are available on our website. Go to www.boruffsautomotivegallery.com to see our entire inventory! Apply for financing safely on our secure website. Call 931-837-2277 or Text 931-272-3561 today for more information. We welcome all trade ins. Come see us today at Boruff's Automotive Gallery 128 East Bockman Way Sparta,Tennessee! Visit Automotive Gallery online at www.bbautomotivegallery.com to see more pictures of this vehicle or call us at 931-837-2277 today to schedule your test drive. The advertised price does not include sales tax,vehicle registration fees, finance charges,processing charges, or any other fees required by law. We attempt to update our inventory on a regular basis, however, there can be lag time between the sale of a vehicle and the update of inventory. EPA mileage estimates are calculated for newly manufactured vehicles only. Your actual mileage will be dependent on how you drive and vehicle maintenance.Extended service warranties are available on most models for an additional charge and can be financed with Boruff's Automotive Gallery with warranty service provided by GWC and their service partners. See sales professional for details.Payment information is based with $2,500-$3500 down in either cash or clear trade equity for 72/75 mo. at 5.99%APR and is with approved credit from Independent Bank, Northwest, and BrandAuto. Additional financing for less than perfect credit available through TCU, Citizens S&L, and AAC. While every precaution is taken to insure accuracy for pricing information you should check first with a sales professional to insure accurate price and payment information.